by Admin.In Flow, Level, Pressure Transmitters, Principals, Temperature. Sitron`s STD-P Pressure Transmitter is designed for both pressure and level measurement of liquids and gases (air) for temperatures between -20C to +80C. 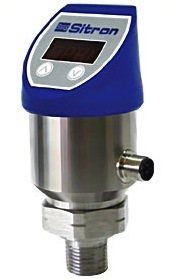 This unit features an integrated digital display (which can be rotated 332º) enabling the user to monitor the signal output at the site of the process, ideal for applications with difficult access or where you need constant follow-up. The innovative mechanical assembly also rotates, making it possible to adjust the positioning of the electrical connection and display window separately. With local push buttons on the face of the housing, set-up and calibration of the alarm points as well as configuration of the digital damping can easily be performed. The STD-P is offered with either a 316 stainless steel or ceramic sensing element, which provides a linear output signal 4 … 20mA (2 wires) or 1 … 5Vdc (optional). Transmitters are custom produced, with various types of connections, and factory calibrated measuring ranges from -1 to 200bar (relative or absolute pressure).